Due to campus closure and mounting smoke concerns, Beta Bowl is being postponed to the spring semester. We apologize for any inconvenience this may cause, but we remain staunch in this decision for the benefit of our philanthropy and to preserve the integrity of the Beta Bowl experience for all participants. 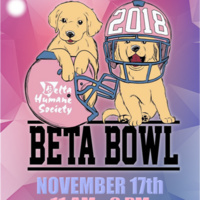 The Beta Bowl is a flag football event to benefit the Delta Humane Society.